Melt the butter in a small pan. While the butter melts, combine flour, salt, baking powder and sugar in a bowl. 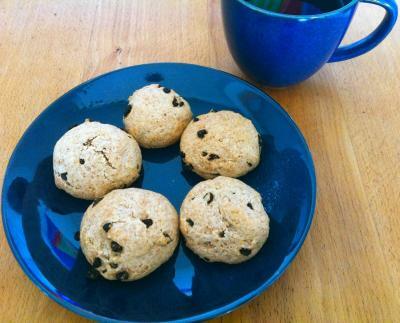 If you use currants or other dried fruit, let them soak in warm water for a few minutes for even more delicious scones. Pour the milk and butter over the flour mixture, sprinkle the currants and lemon zest over it and stir until combined. You might need to knead just a little bit with a heavy spoon or your hands to make a nice, smooth dough, but don't go overboard. If you aren't dying of hunger just yet, let the dough sit for a few minutes for less crumbly scones, otherwise proceed straight to baking. Shape small round scones from lumps of the dough and place them on a lightly greased baking sheet. Bake for about 20 minutes until puffed and golden. Any tea or coffee or hot chocolate. Submitted by Pia on Sat, 2011-10-01 09:46. As somebody who is fortunate enough to be here and enjoy those Saturday morning scones I want you guys to know that they are so delicous.